Share the post "Scary Looking Plant: Bleeding Tooth Fungus"
The Bleeding Tooth Fungus, or Hydnellum Peckiine, a member of the genus Hydnellum of the family Bankeraceae, is one of the most unusual members of Kingdom Fungi. This fungi goes by various names often referring to juice or blood, and it looks kind of like a wad of chewing gum that leaks blood. They’re also called the strawberries and cream, the red-juice tooth, and the devil’s tooth. Whoever is in charge of naming this scary plant seems really insistent that this thing looks like a tooth, while mostly skirting over the fact that it sweats blood. The hood of Hydnellum pecki comes in various shapes, and when it oozes a red, sticky substance, it could easily be mistaken for a bloody tooth dropped on the ground. The substance is sap, forced out of cap’s pores during the night by excess moisture that builds up in the roots. This only happens when the fungus is young. The liquid on most specimens does in fact resemble blood, but can also be light pink, yellow, orange or beige in color. Many describe the liquid as blood-like or juice-like; some may think it resembles liquid candy, (the kind sold in vials at the convenience store). Bleeding Tooth Fungus, even when called “the strawberries and cream” 🙂 is inedible, but it is not considered toxic to humans. This unique mushroom obtains its “inedible” status due to the taste of its flesh and juice which are described as “acrid” or extremely bitter and “peppery.” The aroma of this fungus is often described as being “unpleasant”. The fungus also absorbs from the environment the heavy element cesium-137, a radioactive isotope that could be toxic at sufficient levels. Studies of Hydenellum pecki’s fruiting body have found atromentin, a compound with anticoagulant properties similar to heparin from human blood. Also, it is noted, that this plant has antibacterial properties. Scientists have also discovered the fungus contains antibiotic properties, effective against streptococcus pneumoniae. The mushroom can also be dried and transformed into a plant based dye for cloth, producing an earthy beige color. 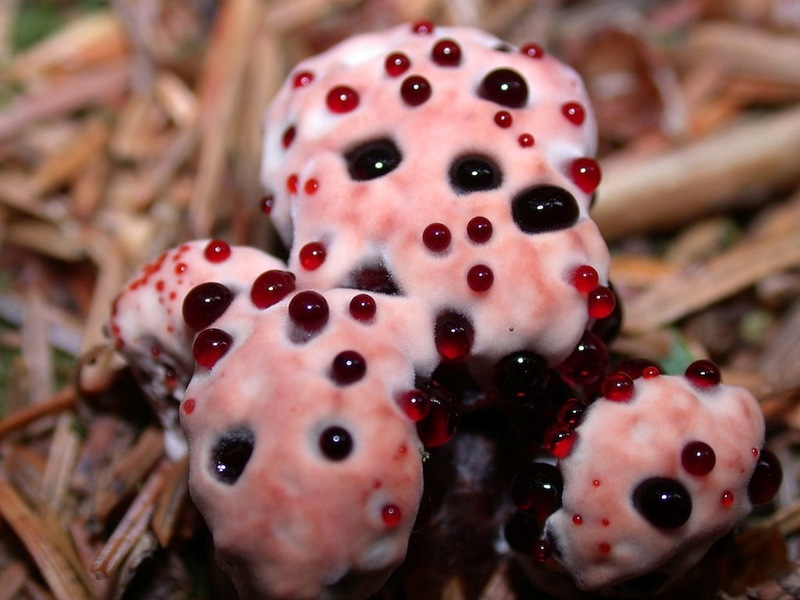 The Bleeding Tooth Fungus can be found in North America where it is more common in the Pacific Northwest and resides mostly in coniferous forests near pine trees. It also makes appearances in Europe and has recently been discovered in both Iran and Korea.